Hello, My Name is Tara. And I'm a Twitter Addict. 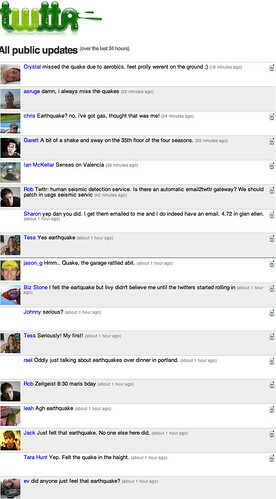 On August 2, 2006, there was a small tremor in the SF Bay area - the first I'd felt since I moved there - and the fact that all the people on Twttr at the time felt it and reported on it together opened up a world of possibility for me. We all rejoiced. It was our early global warning system. This event brought us closer together. We had a service where we could nearly synchronously and publicly share our experience. How cool! I spent the next 6 months telling everyone I knew about Twttr, which became Twitter sometime in the fall of 2006 (can't recall the exact date) in support of the new service I had fallen head over heels in love with. 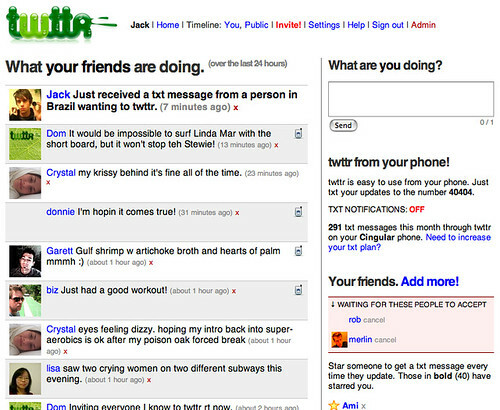 Then SXSW Interactive 2007 happened and Twitter exploded. I blame Robert Scoble ;) but it wasn't actually a bad thing (though I did tell a couple of reporters that I didn't like how Twitter was becoming a popularity contest all of a sudden). Twitter needed a big champion and next thing you knew, everyone was joining in droves. These were still early adopters by and large and the essence of that sharing (sometimes oversharing) culture was still there. But something else started happening. As the conversations grew more numerous and deeper on Twitter, my blogging started to falter. First I went from one post per day to one post every couple of days. After a while, I dropped to a post a week. Everything I used to say on my blog - whether opinion or researched posts - went over to my tweets. And they were conversations instead of a post with comments. This wasn't necessarily a negative thing as many of my posts were probably better off as conversations anyway, but slowly I abandoned my blog altogether, only posting once per month or every two months, which was not nearly frequent enough. Twitter was great for helping me write my book. If I was getting stuck for good examples and case studies (not something one can just Google), I'd go to Twitter and ask. Usually I'd find really cool edge cases that hadn't been used to death. I also watched companies like Zappos grow their activity on Twitter, which provided a better story for me than I had imagined. Twitter was also a wonderful place to go for support and encouragement. People telling me that I can do it. Friends helping me through break-ups and self-doubt. New followers encouraging me by telling me that they were looking forward to the end result. I felt as if Twitter gave me family, friends, colleagues and a robust library of information all at once. Mostly it did. But something else was happening to me. I was becoming reliant on Twitter for everything. And, being a pretty good procrastinator, that everything was wonderfully distracting enough for me to get lazy. Really lazy. Like not change out of my comfies and sit on Twitter (and gMail) for the entire day and get nothing else done. I slipped from using Twitter to my professional and personal advantage (and giving back as much as possible to keep up my relationships) to Twitter being my crutch. When I let the potatoes on the stove boil until the water was gone and become charcoaled because I lost track of time to my Twitter addiction last week, I realized I crossed that line. So...I have put some rules in place for myself now. I can't open Tweetdeck. At all. This service is just too good at pushing me all the information I need to continue in the addiction flow that keeps me from being productive or having a real life. If I'm around people, I don't open Tweetie (on my iPhone) at all. I focus on who I'm with and if who I'm with checks their tweets, I mention it and I don't use it as an excuse to check mine (the spiral of anti-social). I can check the web version of Twitter 2x per day...and the exception is if I post a question and need to have a bit of a conversation. When that conversation is over, I need to exit. I know I've been told to obsessively follow my @'s, my searches (Whuffie, wuffie, tara hunt, whuffaoke, etc. ), but I don't anymore. This may have me falling behind in places, but I lived for years before it existed and I still have Google Alerts. It's only been 4 days and I don't feel any real withdrawal yet. I've been super productive. Finally got focused on a presentation I've been avoiding for a month. In 3 days, I created something I am proud of...without the assistance of tweeps. I went back to reading blogs and news and books and articles and googled stuff and feel my brain engaging again. I finished one book and have moved onto another that I'm excited about. I've written 3 blog posts (in 4 days). I feel calmer because I'm not absorbing the anger that is being shot back and forth between 'sides' of the healthcare debate. I spent more time with my dog, letting him chase squirrels for longer in the park. I cooked healthy meals for my son. I've been putting together that overdue outline for my book. This is only the beginning. It's not the fault of Twitter, either. It's a tool. A great tool. An amazing, game-changing platform for connection and conversation. But it's not a substitute for all the other stuff I was letting it be a substitute for. I'll be taking French lessons, going on actual dates, working out on a regular schedule, working on cool new Montreal community projects, designing a conference, creating a series of deeper presentations, writing another book, meeting new people, hanging with my friends, spending time with my son (as much as he'll allow, of course), taking my dog for more walks, reading a book a week, getting current with the news, going to movies, attending art exhibits, talking to old friends on the phone, writing short stories, meditating, keeping my house clean, traveling and all the other things I've been missing while letting myself fall into the allure of the ongoing Twitter party. Oh...and Twitter isn't the only thing I let distract me. gMail is also bad for me. I'm also limiting my access to that. Wish me luck. It won't be easy.